Let's look at an example ... in the table below, I illustrate Logistic Regression coefficients for the likelihood of a customer buying from email marketing in the next twelve months. 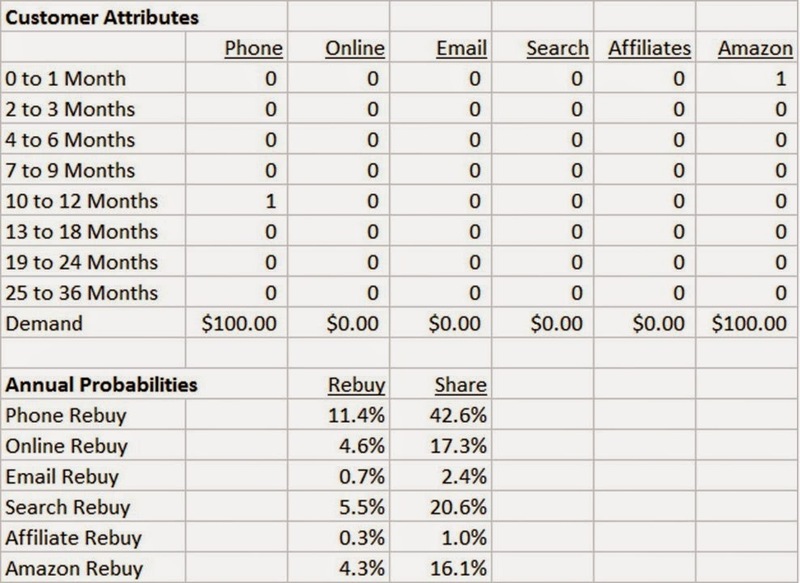 The rows represent recency ... the columns represent prior purchase channels. Let's pretend we have a customer who has only ever purchased one time, and it was via email marketing, and the customer spent $100, and the purchase happened one month ago. For that customer, the probability of buying from email marketing in the next year is ... (-5.216 + 2.423 + 1.841*(100/1000)) ... we obtain a logit value of -2.519, which when transformed (EXP(-2.519) / (1 + EXP(-2.519)) = 7.5%. Now let's pretend that the customer also purchased ($100) via Amazon in the past month ... the equation changes to (-5.216 + 2.423 - 0.031 + 1.841*(100/1000)) = -2.550, which is then transformed (EXP(-2.550) / (1 + EXP(-2.550)) = 7.2%. Do you see what happened there? The very fact that the customer just purchased from Amazon actually caused the customer to become less likely to buy via email marketing. #OhBoy. Each of our businesses possess customers who exist within an ecosystem. A very interesting ecosystem! We've been trained that each incremental purchase is good. Most of the time, each incremental purchase is good! But sometimes, odd dynamics occur. We need to understand odd dynamics. In subsequent posts, I'll show you how these models can be used to combine attributes, and when attributes are combined, we can understand how customers behave and evolve as we promote different channels. The activity leads us to create different trigger strategies for various customers. For instance, here are a set of customer attributes (the customer bought via the phone 10-12 months ago, spending $100), and the predictions by channel. 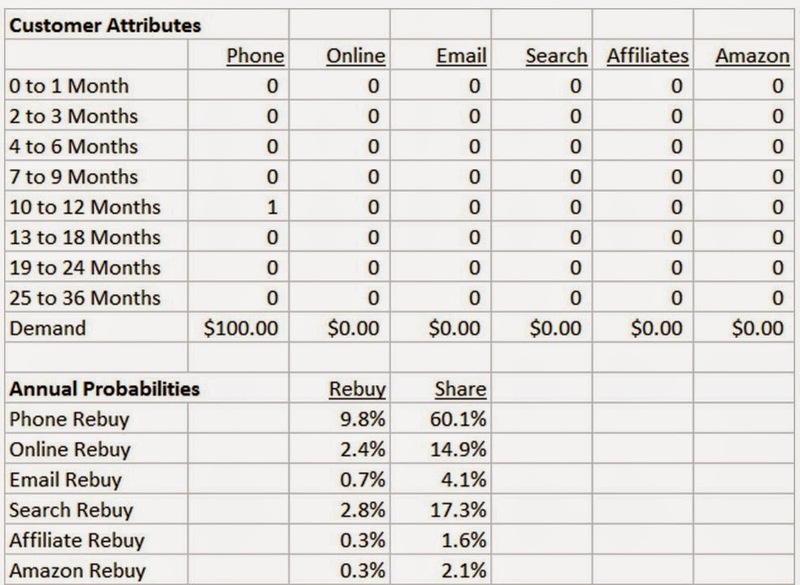 This customer has a 9.9% chance of buying via phone next year ... that's 60% of all outcomes. Now, look at what happens when the customer reactivates via Amazon ... becoming a 0-1 month $100 Amazon customer and staying a 10-12 month $100 Phone customer. In the short term, the Amazon purchase helps catalog responsiveness ... trigger off a catalog, folks! But not so fast. Let's let one more month pass ... now the Amazon purchase is 2-3 months ago. Within just a month, the Amazon purchase helped phone response (catalogs), then hurt phone response (catalogs). Also, look at what happens to Search response in each grid ... low ... then high ... then higher. Yes, the Amazon purchase pushes the prior catalog-centric buyer online, where the prior catalog-centric buyer "engages" in online activities that will cost you even more money. In other words, the Amazon purchase should trigger a catalog, and then, it is quite possible that you might cut back on mailings because response drops and paid search response increases, costing you more money. So this is the stuff we're going to talk about ... your customers interact with your business in fascinating ways, yielding an ecosystem that is not well understood. By combining attributes in a Logistic Regression equation, we set off all sorts of interesting ecosystem findings, don't we?